Sgt. Michael Donaldson of the 42nd Division's 165th Infantry Regiment is one of 25 Congressional Medal of Honor Recipients from New York State from the First World War. Sgt. Donaldson was from Haverstraw, NY and was a member of St. Peter's Parish there where he was an altar boy under Fr. Francis Duffy. Donaldson was a boxing instructor before enlisting in the 69th NY Regiment in Jul7 1917 at the age of 30. Donaldson was reunited with his former parish priest, Fr. Duffy, and spoke highly of him after the war, describing him as "he breathed the fire of life into the soul of the Sixty-ninth." Donaldson recounts his experiences with the Fighting 69th in the book Echoes from Over There. Sgt. 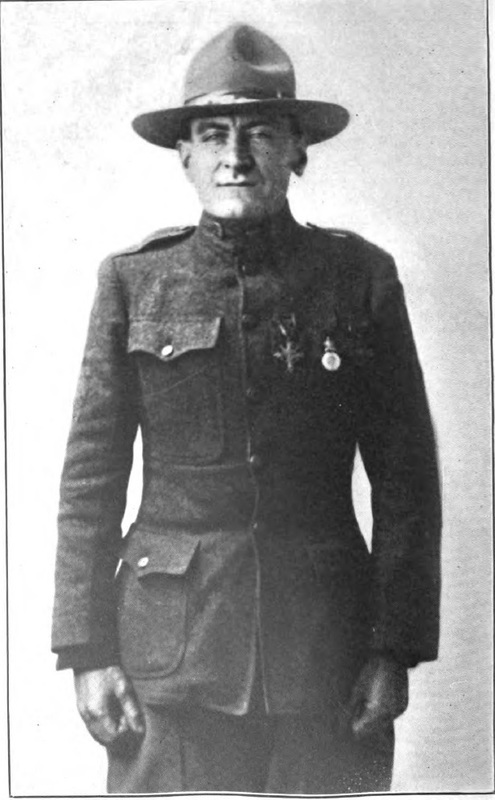 Donaldson was cited for the Congressional Medal of Honor on March 10, 1923. He was one of five members of the 69th regiment who received this honor. According to the New York Times, Donaldson was cited for "conspicuous gallantry and intrepidity above and beyond the call of duty in action against the enemy at Sommerance-Landres-et-St. Georges Road, France, Oct. 14, 1918." During this battle he returned to the line of fire multiple times to save six of his fallen comrades. The Congressional Medal of Honor is the highest award for bravery and courage offered to individuals in the Armed Forces. The President of the United States awards the Medal of Honor to each recipient. In addition to receiving the Medal of Honor, Sgt. 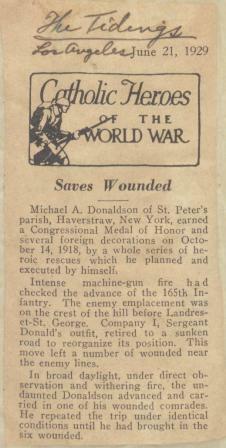 Donaldson was also awarded the Distinguished Service Cross, the Croix de Guerre with palm, and the Medaille Militaire. He was honorably discharged from the Army in 1919. THIS IS TO CERTIFY, That Michael A. Donaldson, Sgt. Co. I., 165th Infantry, THE UNITED STATES ARMY, as a Testimonial of Honest and Faithful Service, is hereby Honorably Discharged from the military service of the United States by reason of Circular 106 W. D., 1918. Said Michael A. Donaldson was born in Haverstraw, in the State of New York. When he enlisted he was 30 2/12 years of age and by occupation a boxing instructor. He had Blue eyes, Brown hair, Fair complexion, and was 5 feet 10 inches in height. Given under my hand at Camp Dix, N. J., this 5th day of May, one thousand nine hundred and nineteen. Name: Michael A. Donaldson. Grade: Sergt. Enlisted, July 13th, 1917, at New York, N. Y. Serving in first enlistment period of date of discharge. Marksmanship, gunner qualification or rating: Not qualified. Battles, engagements, skirmishes, expeditions: Champagne, Marne Def. Oisne, Marne Def., Meuse, Argonne Off., St. Mehiel Off., Luneville Sec., Baccorat Sec., Fre de Vadenay Sec., Pannes Essy Sec., Army of Occupation. Knowledge of any vocation: Boxing instructor. Wounds received in service: None. Physical condition when discharged: Good. Typhoid Prophylaxis completed Sept. 1st, 1917. Paratyphoid Prophylaxis completed Sept. 1st, 1917. Remarks: Distinguished Service Cross, Medaille Militaire, Croix de Guerre, Served with Co. I., 165th Inf. from July 13th, 1917, to date of Dischg. Promoted for bravery. Served in France and Germany. A.W.O.L. from 8-12-18 to 9-15-18.